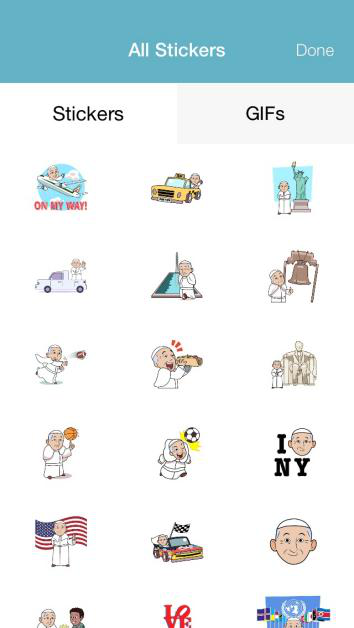 Popemoji: For Pope Francis' American visit Swyft Media has created pope emojis. The popemojis available from Swyft Media. As Pope Francis continues to please the masses by worrying about the environment, fast-tracking annulments, and not judging people for being gay, it can be hard to come up with new ways to express excitement at just how great he is. With his arrival in the U.S. imminent, the Catholic network Aleteia.org with the help of Swyft Media has come up with a solution: popemoji. “It was natural to make [emoji] an element of our digital effort to support Pope Francis’ visit … the Pope has a great sense of humor, is totally approachable and dedicated to engaging people where they communicate,” Kathleen Hessert, founder of Sports Media Challenge, which is overseeing the digital aspect of Aleteia.org’s effort, said in a press release. Indeed, while some might object to the pope’s face being used to express things other than their wholesome intentions, the idea behind the emojis seems to be in line with the pope’s goals: getting more young people excited about the church.